Guinea pigs' teeth grow continuously throughout their life, so they need to chew regularly to keep their teeth down to a healthy size. Chewing on their cage bars could mean they do not have enough things to chew on, but most likely they simply enjoy the feeling of the metal bars. Guinea pigs are born with a natural instinct to chew. Their teeth grow continually throughout their life and chewing keeps them at a healthy length. If guinea pigs are not given enough things to chew on, they will begin chewing on items like their cage bars. If your guinea pig is chewing on her cage bars, there is no need to be alarmed. It could mean that she simply enjoys the sensation that it provides. 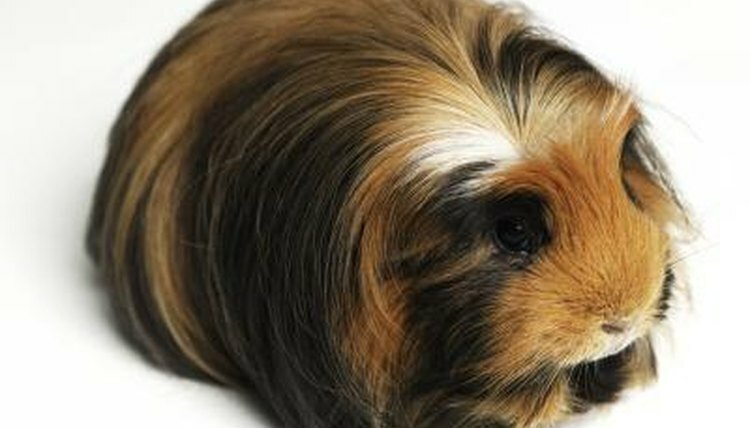 As long as she has plenty of other chew toys designed for chewing and gnawing, your guinea pig is probably very content. One fun way to get some interaction in with your guinea pigs in addition to satisfying their need to chew and providing them with nutrition they need is to give them fruits and vegetables. Because guinea pigs need a good amount of vitamin C, giving your guinea pigs foods like carrots, cucumbers, broccoli and pears will help keep your pets healthy and entertained. Buying your guinea pigs chew toys is absolutely essential. Wooden blocks on small metal chains are a very popular choice, but you can also buy houses that are made of a material that is safe for your guinea pig to chew on. Mineral blocks are a great choice because they provide stimulation for long periods of time for even the most enthusiastic chewers, while giving them minerals and nutrients at the same time. Some guinea pig owners mistakenly buy their guinea pigs salt blocks thinking they will be a fun treat for them. Salt blocks can cause your guinea pigs to have too much sodium in their diet and should be avoided. A mineral block is a much better choice; it provides nutrition as well as chewing stimulation without the harmful side effects. Always check the label on any treats or toys you provide for your guinea pig to make sure they are made out of safe materials and are designed for guinea pigs.